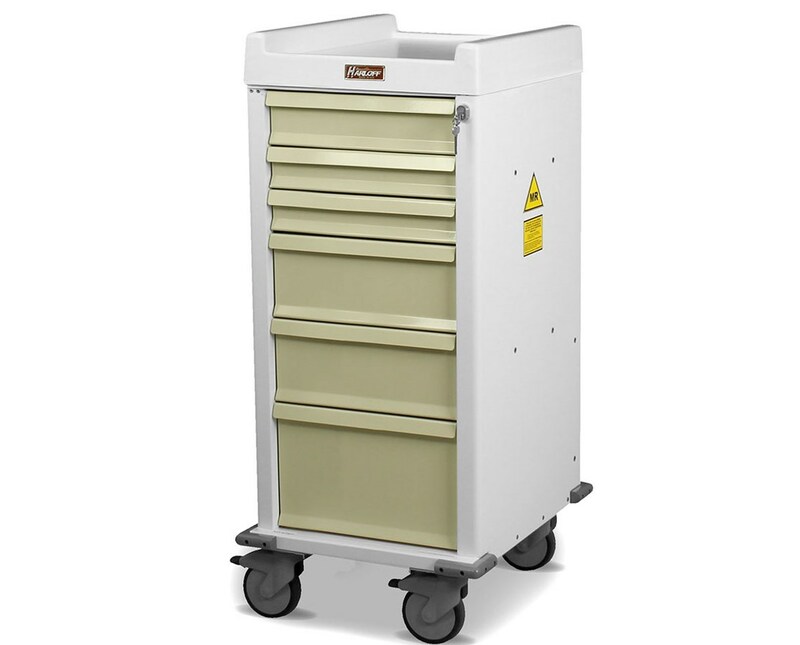 Harloff's MR-Conditional Anesthesia Cart is the ultimate accessory for MRI suites thanks to being designed and built using non-magnetic or "weakly magnetic" materials such as aluminum, stainless steel, plastic and aluminum and brass attachment hardware. This cart is tested by an independent authority to 3 Tesla level and meets the American Society for Testing and Materials (ASTM) International, Designation: F2503-05 definition of "MR-Conditional." 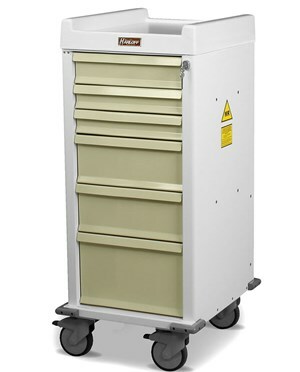 Low-ferrous ball bearings power the full extension drawer slides as well as the 5" full swivel casters (one brake, one directional) for safe, reliable operation. The cart is kept secure by the BEST brand lock on the cabinet (2 keys included), and a full-wrap around vinyl bumper protects the cart from collisions. Plenty of storage is available whether you choose the six drawer model or the seven drawer model. The six drawers are assembled in the following order: (1) 4" drawer, (2) 3.25" drawers, (2) 6.5" drawers and (1) 9.75" drawer. The seven drawer model features, in order: (1) 4" drawer, (4) 3.25" drawers, (1) 6.5" drawer and (1) 9.75" drawer. Other features of this cart include a stainless steel pull-out shelf and a removable/replaceable plastic top with integrated push handles. The cabinet is painted gloss white with a MRI identification sticker applied while the drawers have 13 color options to choose from (all colors come in a hard-baked powder coat finish). The cart is delivered fully assembled with pre-threaded accessory mounting holes and is latex free. We offer Harloff's MR-Conditional Anesthesia Cart with either six or seven drawers and in standard or specialty package configurations. Each model comes in 13 drawer colors as shown in this color chart. Select from the drop down menus above and order online direct by clicking "add to cart!" Number and Size of Drawers Six Model: (1) 4", (2) 3.25", (2) 6.5", (1) 9.75"; Seven Model: (1) 4", (4) 3.25", (1) 6.5", (1) 9.75"